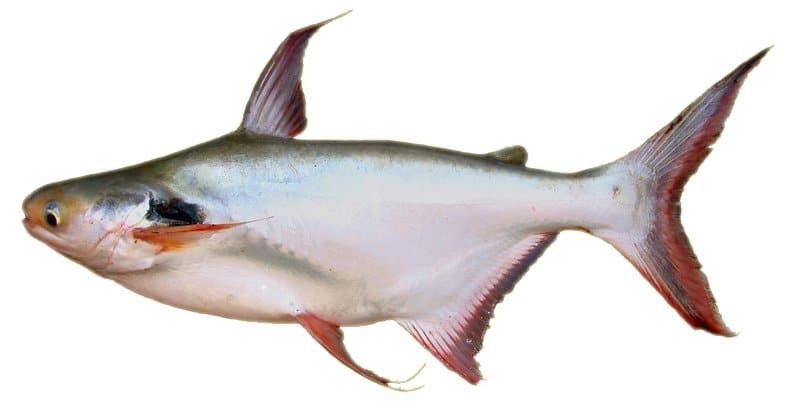 The name of thae phoh curry comes from the black ear catfish (pangasius larnaudii) (in Thai: thaeh phoh, ปลาเทโพ). Hard to catch, this elusive freshwater fish is an essential and much sought-after ingredient for this dish, with its belly the preferred cut to use. 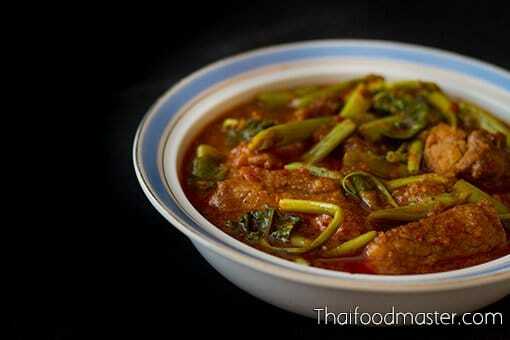 It was cooked together with water spinach (phak boong, ผักบุ้ง) or with deep-fried vegetables. 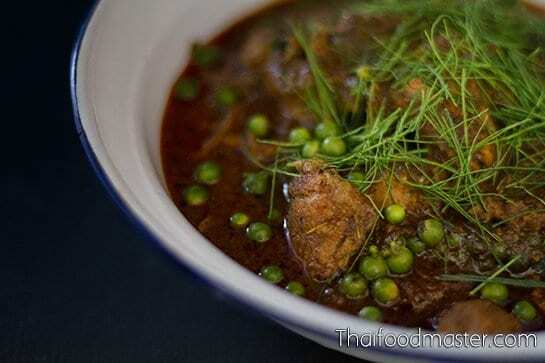 Thai cooks sometimes resorted to other meats, due to the difficulties in obtaining the black ear catfish, but the dish retains its name. 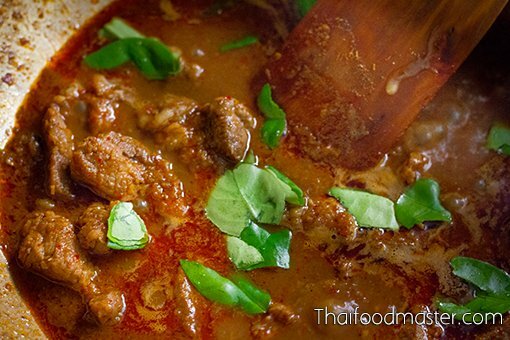 Thae phoh curry is a spicy and salty Thai red curry with sour-sweet flavor shades. 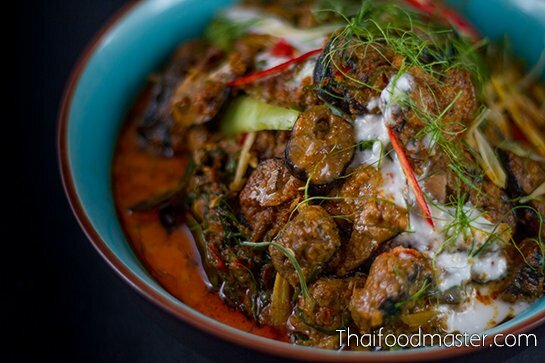 Thae phoh falls into the category of the gaaeng khuaa (แกงคั่ว) style of Thai red curries, as it contains no dry spices except white peppercorns. 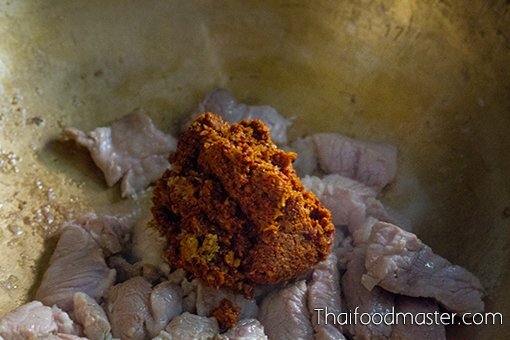 Instead, smoked dried fish meat is added to the red curry paste to accentuate and widen its umami-smoky savory flavor base. 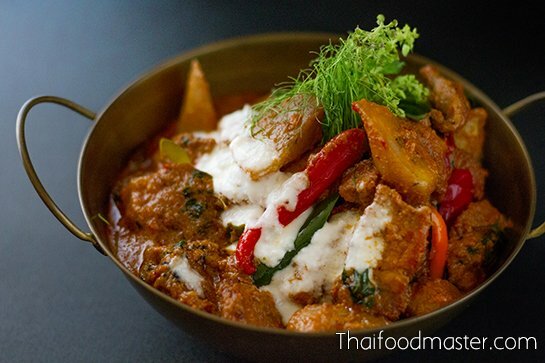 These days, many would consider this dish to be a coconut-based Thai red curry; however, it can also be cooked as a water-based curry. 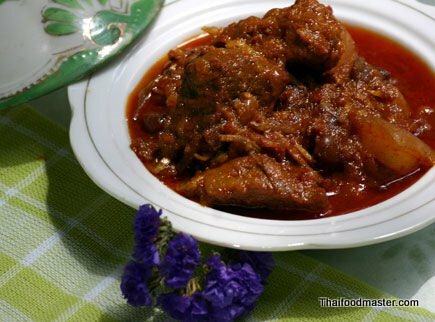 This is because thae phoh curry evolved from a water-based sour curry called gaaeng chak sohm (แกงชักส้ม). 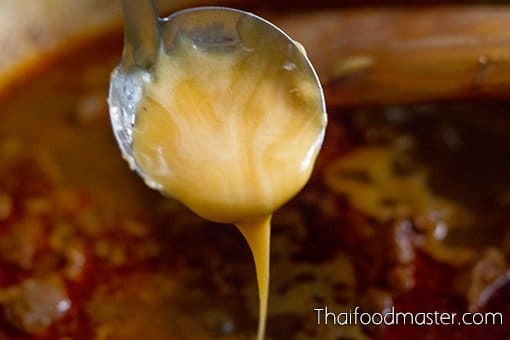 But the practice of adding coconut cream to thae phoh curry makes culinary sense, as it underscores the oily rich properties of the ancient version. 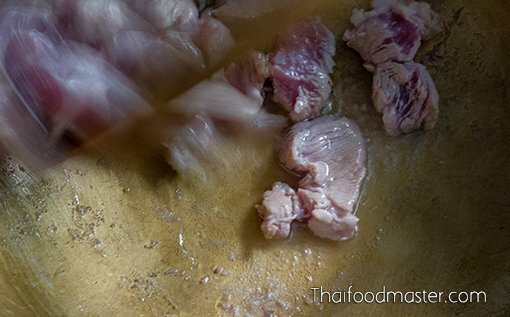 As well, since black ear catfish meat is not always available, the dish can be cooked with fatty pork cuts such as the belly or neck, or a combination of pork meat and pork lard. In some cases, other oil-rich fish can be used, including queenfish (scomberoides commersonnianus, bplaa sala, ปลาสละ). 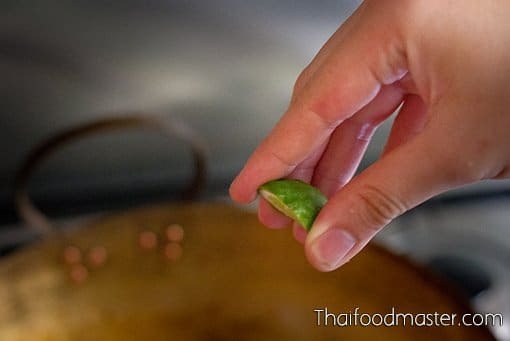 Maawm Luaang Tew Chonmakphichan, the head of the royal kitchen serving the late H.M.K Bhumibol Adulyadej (Rama IX) between the years 1954-1965, clearly confirms in her article “What should we eat and in which month? 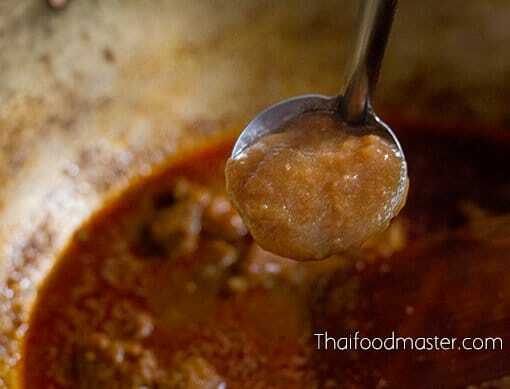 (เราควรรับประทานอะไรเดือนไหนดี)” that the name thae phoh curry applies to the dish – even when it is cooked with pork meat. Bpradtithin Bat Laae Joht Maai Haeht (ประติทินบัตร แล จดหมายเหตุ) was a monthly journal published just five times between 1889 and 1890. 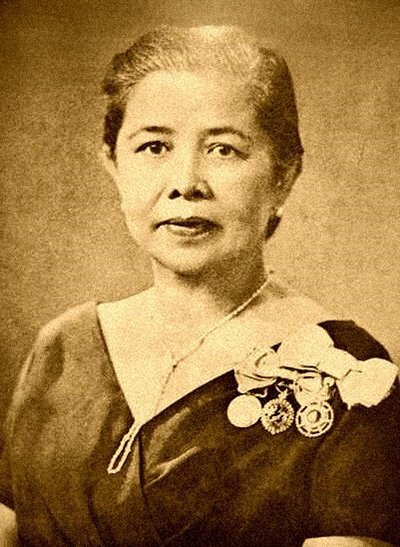 Lady Plean Passakornrawong, the author in 1908 of the epic cookbook “Maae Khruaa Huaa Bpaa (แม่ครัวหัวป่าก์)”, published a food column for the journal, in which she shared recipes. 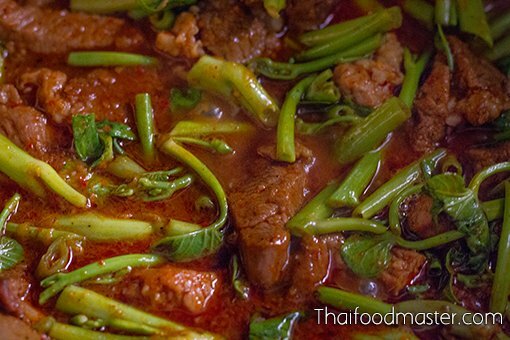 In the journal’s third volume, Lady Plean records a recipe for thae phoh curry with pork and water spinach (แกงหมูเทโพใส่ผักบุ้ง). 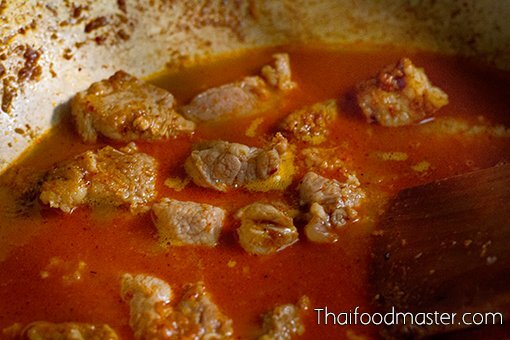 In the fifth volume, she shares a thae phoh curry recipe using pork and madan (sour cucumber, Garcinia schomburgkiana, แกงหมูเทโพกับมะดัน). The version below comes from Lady Plean Passakornrawong. 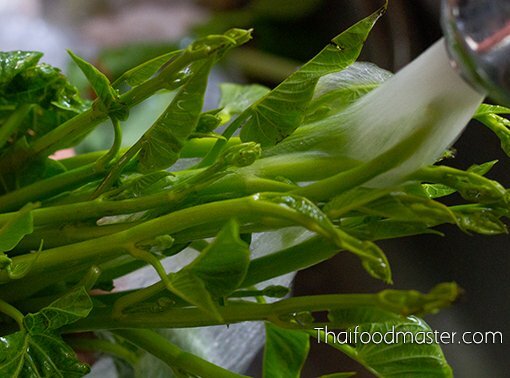 It is water-based and uses water spinach: we provide this version of the dish so that readers who may already be familiar with the coconut cream version have an opportunity to try another version of thae phoh curry. 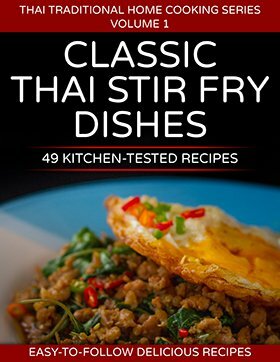 We also hope that readers who are interested in Thai culinary evolution will enjoy experiencing this curry, and learning to prepare it as it was made in the past. 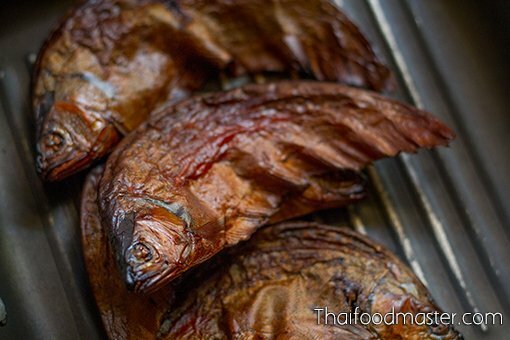 Char-roast the smoked dried fish until it is fragrant; then, using your hand, crumble it, discarding the fish bones and the abdomen. (Parasites often reside in the abdomens of freshwater fish). In a pestle and mortar, pound the fish meat into a coarse powder. In a pot, melt pork lard over medium-low heat. Fry thinly sliced garlic until it is golden. 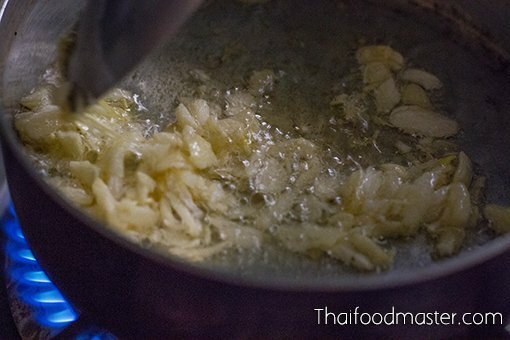 Strain and reserve both the fried garlic and oil. Set aside. 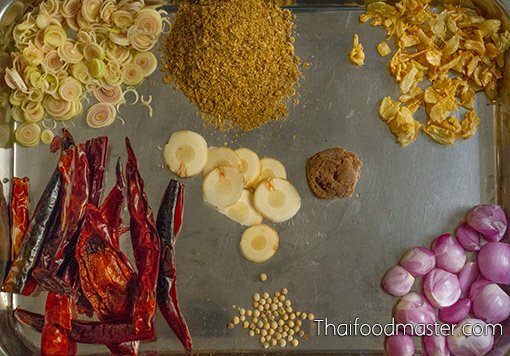 The complete set of ingredients used to prepare the curry paste: lightly char-roasted dry bird’s eye chilies, finely chopped lemongrass, pounded smoked dried fish meat, deep-fried garlic, peeled shallots, sliced galangal, high-quality fermented shrimp paste, and white peppercorns. 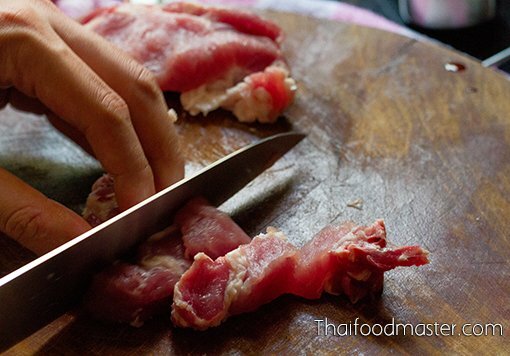 Slice the pork neck into large bite-size pieces. Wash the water spinach with plenty of water, and cut into 10cm (4”) pieces. 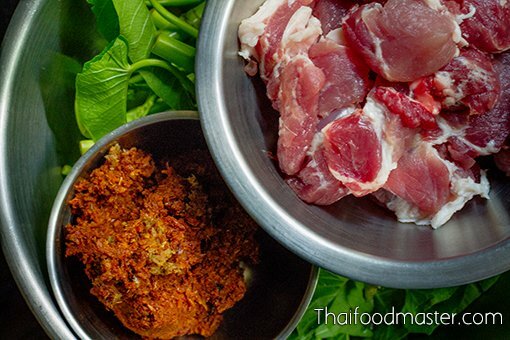 The complete set of ingredients ready to cook the curry; the pork cubes, curry paste and water spinach. In a pot, melt pork lard over medium-low heat. 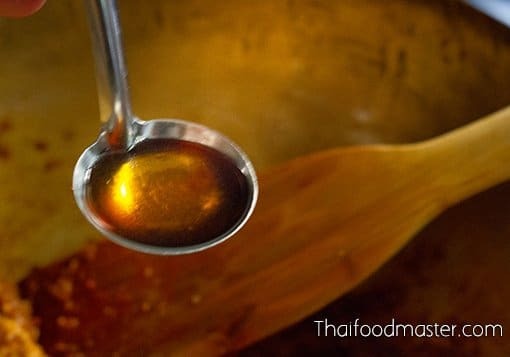 (You can use all or some of the oil used to fry the garlic). 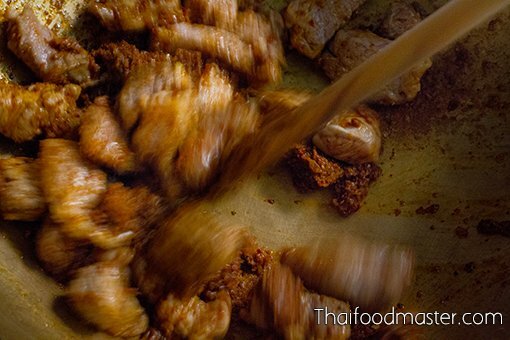 Add the pork meat and fry the pork meat until it is seared on all sides. 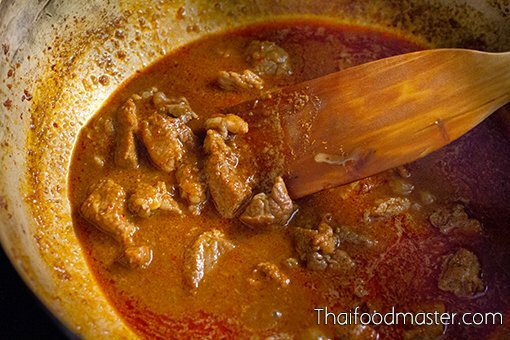 Continue frying the meat until the curry paste is fragrant, and the pork is almost fully cooked. Add water to cover the pork, and bring to a boil. Add hand-torn kaffir lime leaves. Add a squeeze of kaffir lime. 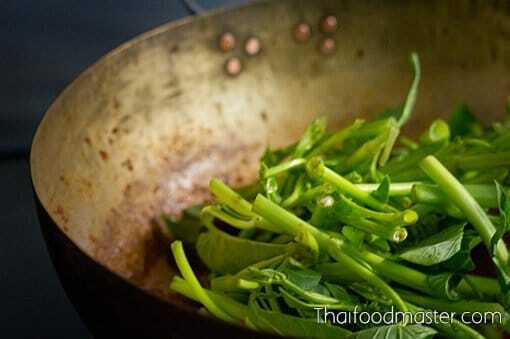 Cook until the water spinach is soft.